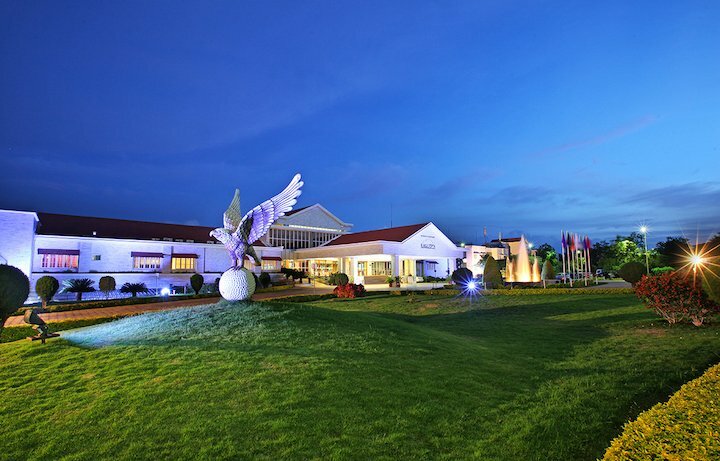 Eagleton – The Golf Village is a leading resort when it comes to extending luxury and leisure options to businessmen and corporate executives. Their golf course is considered to be one of the five best golf courses in India. The club house/hotel is spread over 300,000 square feet and is well equipped with state of art amenities and facilities. The resort provides a perfect blend of elegance and leisure and there are many options for residents including conference rooms, guest houses, and a championship golf course. The resort also serves as an ideal weekend getaway. The resort has two club suites, 42 executive suits, sixty deluxe rooms and three club suites. Most rooms face either the golf course or the swimming pool, and you can pick a room based on your preference. There are ten conference halls that can accommodate close to seven hundred people. Eagleton has a lush green golf course that is spread over one hundred and 68 acres of land. The air-conditioned property which covers three lakh square feet boasts of a lavish conference hall, indoor games for kids and adults, a swimming pool, and a multi-cuisine restaurant. Guests can also play squash, table tennis, and indoor badminton as all the required facilities will be available. Another attractive feature of this property is the health club which houses a gymnasium, a spa and sauna bath. There are a separate meditation and yoga center which will help you feel completely rejuvenated mentally and physically. All rooms in this resort come equipped with multi-channel televisions, internet connectivity, telephone facility (with direct dialing options), and bathtubs. The Executive Suite at Eagleton is well equipped and round-the-clock services and facilities are provided to the guests. Eagleton has a coffee shop, a bar/pub and a multi-cuisine restaurant that serves South Indian, Continental, North Indian and Chinese food. The Tandoor dishes in this restaurant are also quite tasty. This place is just a 30 minute drive from Bangalore and it lies on the Bangalore-Mysore highway. You can opt for buses that run from Bangalore or Mysore to reach Eagleton. People who come here for a quick stay normally bring their vehicles. There’s a Stay and Play Golf package that you can go for, and this package will cost around INR 6,999 for one night and two days. If you’re looking to learn and play golf, then you would have to pay close to INR 13,999 overall. Late evenings can be spent partying and enjoying a drink at the multi-purpose banquet.